Pancakes at Carillon is Perth's best known and long time loved pancake restaurant that has been a city tradition for many, many years. I have such fond memories of Pancakes at Carillon as a child. Getting on the bus to “go to town” with my mum, back in the days when they still hung prams on the back (sans baby). Pancakes seemed like this magical place where your mum let you eat dessert in the middle of the day. I think if you ask my youngest after our visit, it still is! We were all super excited to get to head there for hubby’s birthday and enjoy some Perth family treats. We arrived in Perth early enough that we could roam around and look at the huge skyscrapers and explore the malls. Before heading into the Carillon arcade we wandered down Grand Lane which is just at the end of Murray Street Mall to check out some awesome street art. By then the kids (and perhaps hubby if I am honest) had started whinging about how hungry they were. Offers of apples and corn chips were swiftly rejected, most likely because the only word on everyone’s lips was – PANCAKES! So we headed up to the restaurant, where we are greeted at the door with a smile and shown quickly to our booth. There is something about eating in a booth that is just a bit cool, additionally as a parent it makes it way harder for the kids to get out and escape. 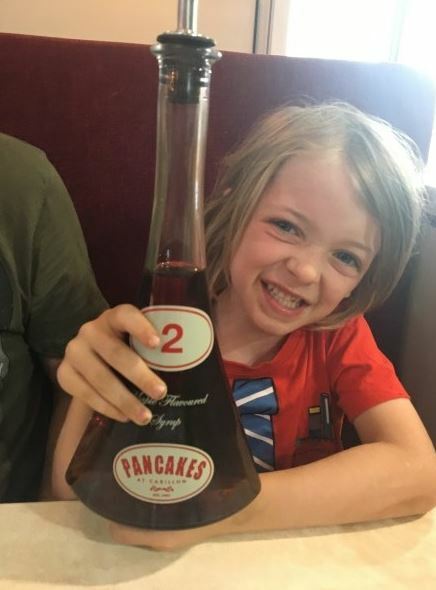 I was really impressed with the serving staff at Pancakes, and as someone who spent many years in hospitality including as a restaurant manager that is no easy feat. There wasn’t a time I needed to ask for anything, they were on hand promptly with water, menus, cutlery and I heard them check at every table several times on whether the guests were happy. It was very apparent that the staff were there to make the dining experience perfect and it was a bonus to enjoying our Perth family treats. But you want to hear about the food right?? It was also perfect! Our choices of main and dessert were slightly ambitious but the food was so good we put in our absolutely best effort to finish it. One of the great things about coming here is you can go full on pancake mad or you can have a “normal” main and then just top it off with pancakes, or you know….just go for sweet pancakes and skip the savoury all together. We were offered colouring for the kids and that occupied them easily for the short time between ordering and our food arriving. The kids food came out first thankfully, as a parent there is nothing worse that getting your food before your kids – chances of eating it peacefully are completely nil. With the kids happily munching on nuggets and chips our food arrived. 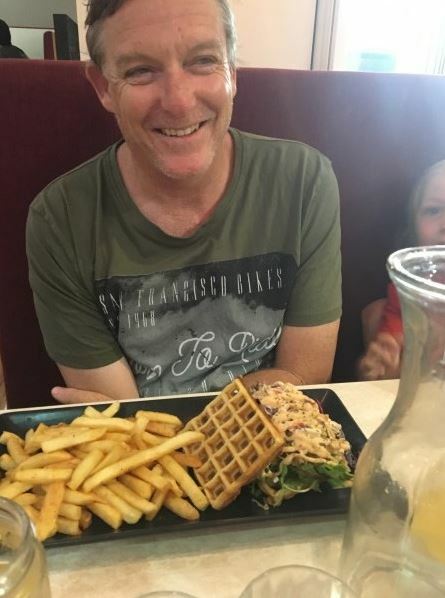 Hubby, was very chuffed with his pulled pork waffles and I chose a chicken salad which was absolutely delicious. Mine came with a really delicious dressing and when the kids finished their own they polished off the rest of my salad, munching their way through the different lettuces, red onion and capsicum. 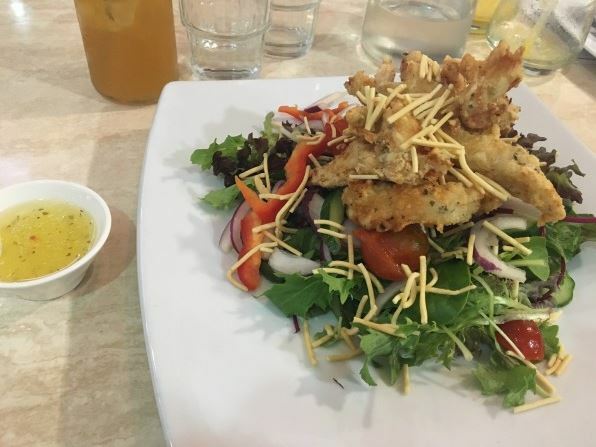 We could not find a single thing to complain about the food was perfectly cooked and the flavours were amazing, add to that they were very reasonably priced. When it came time for dessert our eyes boggled at the pancakes, though I guess this is their piece de resistance. It’s a bonus to be able to get gluten free pancakes and I chose mine covered in blueberries (which were mostly stolen by my youngest child) with cream and icecream. Hubby chose banana rama – maybe he was reliving the eighties, and his was covered in banana and caramel. 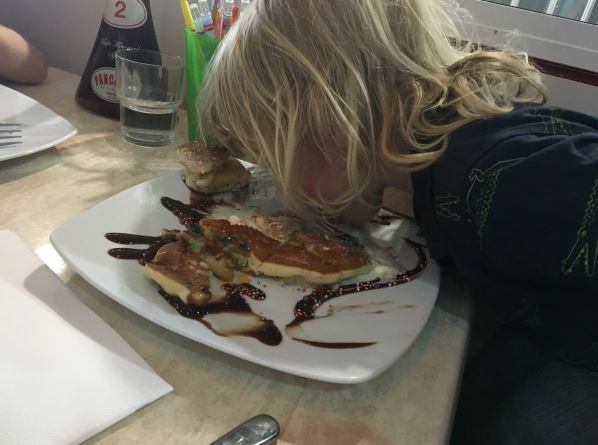 Our eldest likes his pancakes traditional and had been chanting “syrup, syrup, syrup” pretty much for the last 3 days so it’s no surprise he chose plain pancakes with icecream and then drowned them in syrup. 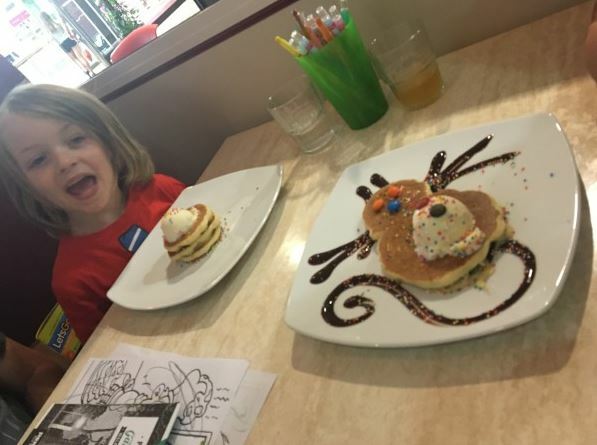 By our little guy chose cat pancakes and was delighted with them…then proceeded to lick the chocolate directly from the plate just like a cat. Our time at Pancakes at Carillon was so much fun and with our tummies groaning from too much, very yummy food we finally left. Often as an adult, childhood places can be disappointing but I can honestly say the magic at Pancakes at Carillon is still there no matter how old you are! Mother of 2 boys under 5 Sharon often describers her life as organised chaos, but she wouldn't change a thing! An Executive Virtual Assistant, Sharon supports heart led women in business from her home office in the middle of the bush on the outskirts of Toodyay.